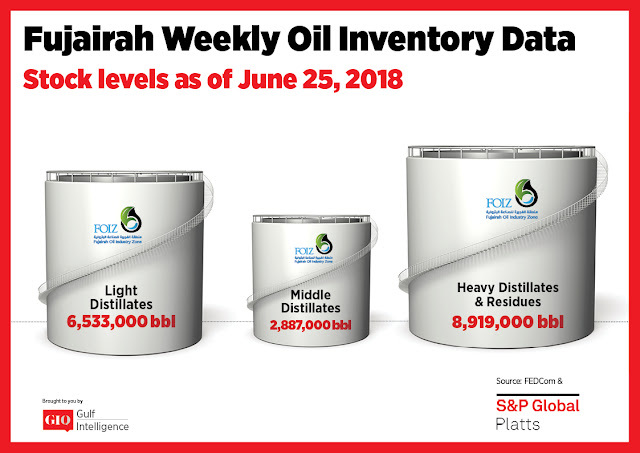 Oil product stocks at the Middle East's key oil hub of Fujairah rose 3.6% in the week to Monday, rebounding from a five-week low, as light, middle and heavy distillates all saw builds. Total oil stocks were 18.339 million barrels, up 645,000 barrels from a week earlier, according to the Fujairah Energy Data Committee. The biggest increase was in light distillates, which rose 7.9% to 6.533 million barrels. 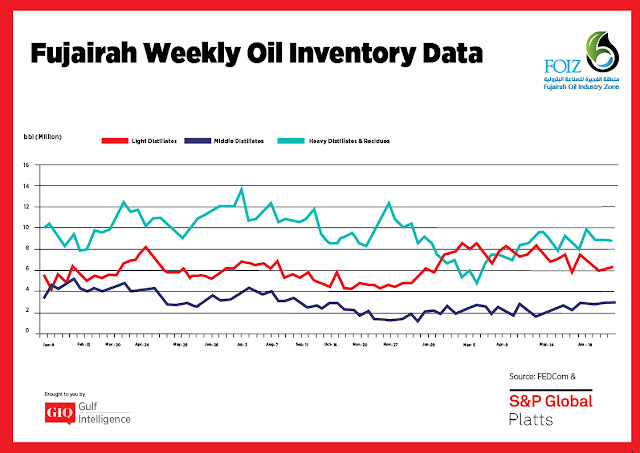 "Activity in the Middle East gasoline market has begun to pick up after the end of the Eid holiday season," S&P Global Platts Analytics said in a report Wednesday. The Mediterranean gasoline market was seen as mostly balanced, the report stated, supported in part by buying interest from India and the Middle East, "depending on which arb is cheaper," according to a trading source. Premiums for Arab Gulf RON 95 gasoline rose to a near six-month high of $3.70/b. Middle distillate stocks rose 5.2% on the week to 2.887 million barrels. First/second month Singapore gasoil swaps went into contango Tuesday on mounting supplies in Asia and weak sentiment. In Europe, imports from the US Gulf Coast are making up for low gasoil stocks. "This limits the arbitrage opportunities from the East of Suez, leaving excess barrels within the region," Platts Analytics said. Kuwait's KPC has been a recent active seller in the 0.05% sulfur gasoil market. Heavy distillate and residue stocks rose 0.2% on the week to 8.919 million barrels. Platts Analytics said it expects regional demand for fuel oil to remain elevated through the summer due to demand for power generation. But price volatility hit the market in the wake of last week's OPEC meeting.